Sometimes we have a lot of mango leftover if we buy a big container from Costco. Now we can make this Mango Bread recipe. We are big fruit eaters so often I’ll buy big containers of fruit from Costco. Sometimes, we do not get a chance to finish the fruit and I usually end up freezing it for smoothies. Now, we have another use for extra mango. 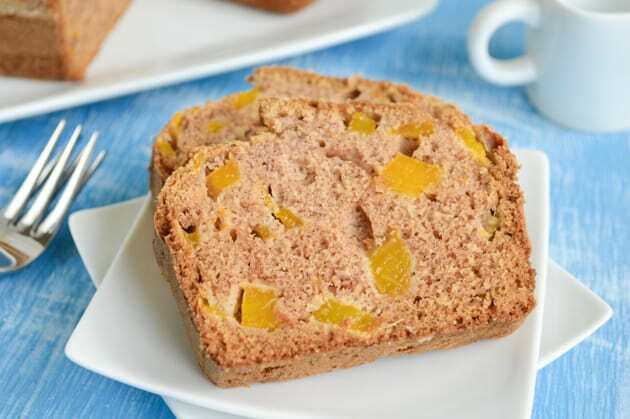 If you have some extra mango, or just really like mango, then take a look at this Mango Bread recipe by star Chef Allen of the upcoming South beach mango festival! 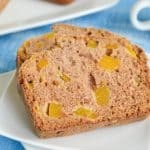 For the mango bread recipe, you’ll need butter, sugar, very ripe mangos, egg, vanilla extract, lime juice, all-purpose flour, baking powder, baking soda, cinnamon, and chopped walnuts. To prepare the batter: In a large mixing bowl cream the butter and sugar. Add the mango, egg, vanilla, and lime juice. In a separate large bowl, combine the flour, baking powder, baking soda and cinnamon. Add the mango mixture to the flour mixture stirring until the dry ingredients are just moistened. Stir in the walnuts. To bake the mango bread: Preheat the oven to 350 degrees. Coat a 9x5x3 inch non stick pan with non stick cooking spray. Pour the batter into the prepared loaf pan. Bake for 40 minutes, or until a toothpick inserted into the center, comes out clean. Cool in the pan 10 minutes before removing from the loaf pan. Allow to cook for 1 hour on a rack before serving. « Harry Potter DVD: The Complete 8-Film Collection – Big Discount!